Bible (Biblia Sacra Latina, Versio Vulgata). Germany; Late 15th Century. Latin Text; Semi-Gothic Script. 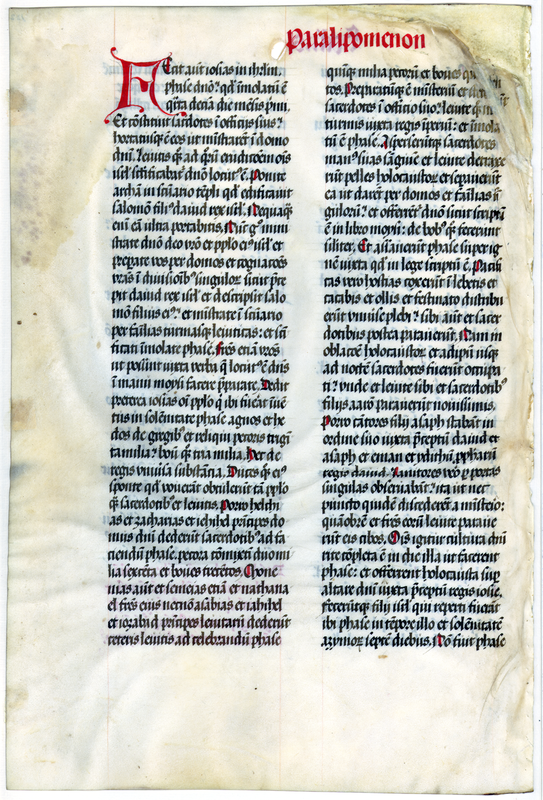 The Vulgate Bible, a translation credited to St. Jerome, was adopted by the Catholic Church as the authorized version. This leaf was written in Germany nearly sixty years after the invention of printing by movable type. Its semi-gothic book hand is very similar to the type-faces used by the early printers. The numerous contractions and marks of abbreviation have been inserted boldly, but the little strokes which were added to help identify the letters "i" and "u" are barely visible. The new art of printing concerned itself at once with the printing of Bibles of folio size, in Latin as well as the vernacular. In Germany, prior to the discovery of America, twelve printed editions of the Bible appeared in the German language and many others in Latin. An oversupply developed, and more than one printer of Bibles was forced into bankruptcy. Observations: The vellum is slightly yellowed and thick, bending easily. There is only vertical evidence of lining, which is done in red; the bulk of the text is in dark brown with red decoration. An unusual feature of each of these leaves is the significant repair to the upper inside corners (i.e., toward the binding, not on the outer edge). Text: 2 Chronicles 34:18-33 (recto) and 35:1-18 (verso). reveritúsque fáciem meam scidísti vestiménta tua, et flevísti coram me: ego quoque exaudívi te, dicit Dóminus. Jam enim cólligam te ad patres tuos, et inféreris in sepúlchrum tuum in pace: nec vidébunt óculi tui omne malum quod ego inductúrus sum super locum istum, et super habitatóres ejus. Retulérunt ítaque regi cuncta quæ díxerat. At ille convocátis univérsis majóribus natu Juda et Jerúsalem, ascéndit in domum Dómini, unáque omnes viri Juda et habitatóres Jerúsalem, sacerdótes et Levítæ, et cunctus pópulus a mínimo usque ad máximum. Quibus audiéntibus in domo Dómini, legit rex ómnia verba volúminis: et stans in tribunáli suo, percússit fœdus coram Dómino ut ambuláret post eum, et custodíret præcépta, et testimónia, et justificatiónes ejus in toto corde suo, et in tota ánima sua, facerétque quæ scripta sunt in volúmine illo, quod légerat. Adjurávit quoque super hoc omnes qui repérti fúerant in Jerúsalem et Bénjamin: et fecérunt habitatóres Jerúsalem juxta pactum Dómini Dei patrum suórum. Ábstulit ergo Josías cunctas abominatiónes de univérsis regiónibus filiórum Israël: et fecit omnes qui resídui erant in Israël, servíre Dómino Deo suo. Cunctis diébus ejus non recessérunt a Dómino Deo patrum suórum. ...book. And he read it before the king. 19 And when he had heard the words of the law, he rent his garments: 20 And he commanded Helcias, and Ahicam the son of Saphan, and Abdon the son of Micha, and Saphan the scribe, and Asaa the king's servant, saying: 21 Go, and pray to the Lord for me, and for the remnant of Israel, and Juda, concerning all the words of this book, which is found: for the great wrath of the Lord hath fallen upon us, because our fathers have not kept the words of the Lord, to do all things that are written in this book. 22 And Helcias and they that were sent with him by the king, went to Olda the prophetess, the wife of Sellum the son of Thecuath, the son of Hasra keeper of the wardrobe: who dwelt in Jerusalem in the Second part: and they spoke to her the words above mentioned. 23 And she answered them: Thus saith the Lord the God of Israel: Tell the man that sent you to me: 24 Thus saith the Lord: Behold I will bring evils upon this place, and upon the inhabitants thereof, and all the curses that are written in this book which they read before the king of Juda. 25 Because they have forsaken me, and have sacrificed to strange gods, to provoke me to wrath with all the works of their hands, therefore my wrath shall fall upon this place, and shall not be quenched. 26 But as to the king of Juda that sent you to beseech the Lord, thus shall you say to him: Thus saith the Lord the God of Israel: Because thou hast heard the words of this book, 27 And thy heart was softened. and thou hast humbled thyself in the sight of God for the things that are spoken against this place, and the inhabitants of Jerusalem, and reverencing my face, hast rent thy garments, and wept before me: I also have heard thee, saith the Lord. 28 For now I will gather thee to thy fathers, and thou shalt be brought to thy tomb in peace: and thy eyes shall not see all the evil that I will bring upon this place, and the inhabitants thereof. They therefore reported to the king all that she had said. 29 And he called together all the ancients of Juda and Jerusalem. 30 And went up to the house of the Lord, and all the men of Juda, and the inhabitants of Jerusalem, the priests and the Levites, and all the people from the least to the greatest. And the king read in their hearing, in the house of the Lord, all the words of the book. 31 And standing up in his tribunal, he made a covenant before the Lord to walk after him, and keep his commandments, and testimonies, and justifications with all his heart, and with all his soul, and to do the things that were written in that book which he had read. 32 And he adjured all that were found in Jerusalem and Benjamin to do the same: and the inhabitants of Jerusalem did according to the covenant of the Lord the God of their fathers. 33 And Josias took away all the abominations out of all the countries of the children of Israel: and made all that were left in Israel, to serve the Lord their God. As long as he lived they departed not from the Lord the God of their fathers.